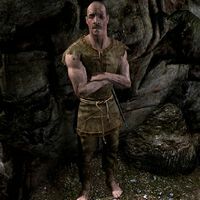 Grisvar the Unlucky is a Nord thief who has been locked up in Cidhna Mine for life after committing many crimes. He carries two shivs. In exchange for a bottle of skooma, he will give you a shiv. If you decide to accept Madanach's help he will order you to kill Grisvar as a "show of loyalty". Shiv: Obtain a simple weapon from a fellow prisoner. This page was last modified on 7 July 2015, at 20:39.